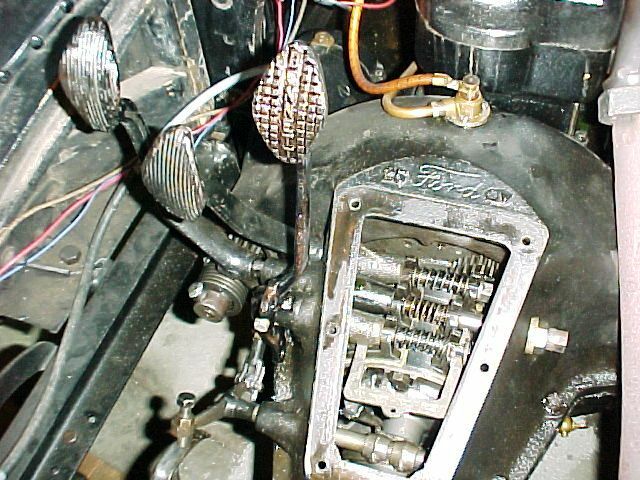 Model T Ford Forum: Tips for Installing a Rocky Mountain Brake Pedal? Tips for Installing a Rocky Mountain Brake Pedal? 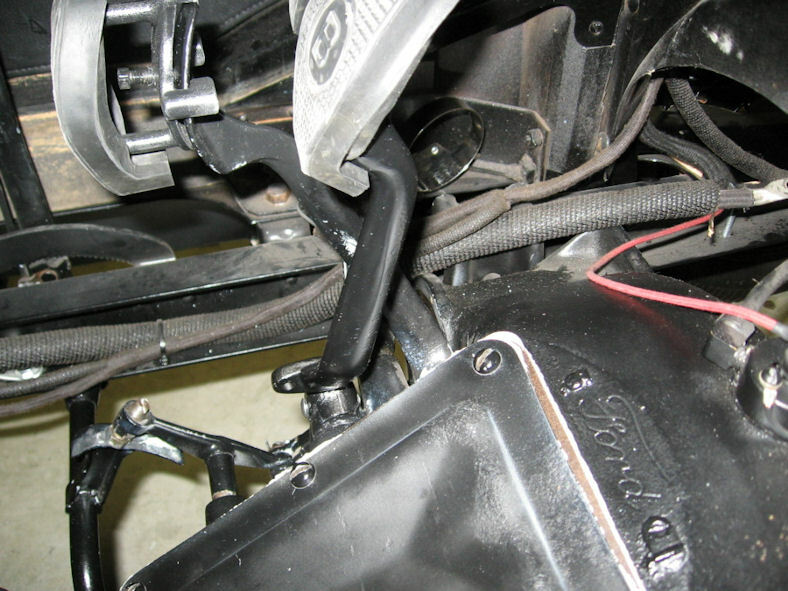 Model T Ford Forum: Forum 2013: Tips for Installing a Rocky Mountain Brake Pedal? Hello all, today's project is to install a Rocky Mountain brake pedal onto my 1923 touring / pickup conversion. I got the old brake pedal off without any issues, but the extension on the bottom of the Rocky Mountain brake pedal prevents it from going back on the way the old pedal came off. It looks like I'm going to have to wire-tie the reverse band ears together, then loosen the reverse pedal enough to let it flop forward out of the way. I'm sure several folks on this forum have done this installation, is there another way to do it? You should be able to just push the reverse pedal forward with one hand while you slip the brake pedal shaft in with the other hand. Thanks, Royce. I see in your picture that the Bendix cover is off, is that also necessary? I did try just pushing on the reverse pedal, but it didn't give quite enough room, so I'll try loosening up the reverse adjustment to allow more pedal travel. I had to pull the Bendix cover to get the brake pedal in. The cover was in the way. You need the link between low pedal and clutch lever to be off. 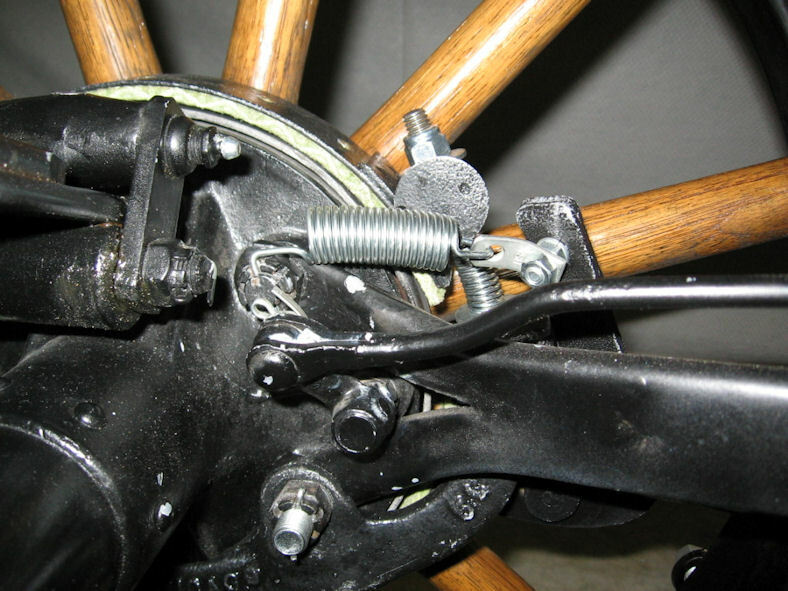 The link, when replaced should be in the direction that the rod is toward the bendix cover and the cotter pin toward the hogshead. If you put it on backward, you will have interference between the link and the rocky linkage. You shouldn't need to do anything to the reverse band. Ok, thanks, I'll pull the bendix cover and low pedal link and try again. The link is currently installed the correct way, I'll make sure it goes back that way when I put it back together. I pulled the Bendix cover and the low pedal link. The new pedal still wouldn't quite go in, so I pulled the Bendix spring collar on the end of the starter shaft. That finally gave me enough clearance, so I slid the new pedal in and slid on the band spring. Then, I noticed that the pedal shaft O-ring had slipped out of position, so I pulled the pedal back out to work on the O-ring. I forgot about the band spring and it slipped off the pedal shaft and down into the bottom of the transmission somewhere, I can't see it even after draining all the oil out. Is there a chance that I'll be able to retrieve it from the front if I pull the oil pan inspection cover? I tried feeling for it through the drain plug hole and fishing around for it through the hogshead inspection cover hole with a magnetic tipped rod, no luck. This is a self-induced disaster, so I deserve whatever admonitions & ridicule you want to heap on me. After that, whatever suggestions you can offer would be welcome, thanks. If you remove the starter you might be able to see it. Engine pan door next. I was able to retrieve a nut and washer with a magnet on a long bendable handle. A mistake I shall NEVER make again! If it doesn't come out with a magnet on a flexible shaft try a piece of bailing wire with a U-shaped hook on the end. It may take some time but eventually you will snag the spring. I have also had luck cranking over slowly and letting the magnets do their job. Thanks, a friend of mine is coming down to slowly turn the engine with the crank while I watch for the spring. My car doesn't have a magneto, but maybe one of the oil paddles on the flywheel will capture the spring and bring it to the top. I will try pulling the starter as well. Thanks for the suggestions, I'll let you know how it goes. It may take a while, my style on these kinds of things is to work at it for a while, then stop and let it (and me) rest for a while, then go at it again fresh. Without the magnets, you should be able to hook it with a bent wire or pull it with a magnet on a flexible rod. Just keep trying. You will eventually find it. Success! The spring had fallen close to the bottom of the transmission pan, but we couldn't see it or feel it through the drain plug hole. However, by fishing a flexible, magnet-tipped rod up through the drain plug hole, we were able to capture and push the spring back up the pan, high enough to be able to see it from the top inspection cover. Once we could see it, we were then able to grab it and pull it out with one of those retractable, two-prong hook fishing tools. Disaster averted! There's plenty of room to install the new brake pedal now, I'll start reassembling everything tomorrow. Thankyou everyone for your suggestions. Update - I got the new Rocky Mountain brake pedal installed this morning, the bands and the clutch link are re-adjusted, and the trans cover plate is back on. One thing I noticed is that the upper "ear" on the Rocky Mountain brake pedal (I assume it is there to attach a return spring) hits the floorboards when I depress the brake pedal. Since I'll be putting my return springs back at the actuating arms of the brake assemblies, I won't be using the "ear", so I'm tempted to cut it off. Of course, I could also cut the floorboards to provide the required clearance. Has anyone else run into this problem? If so, which path did you choose and how did it work out? Here is a photo of the new pedal and the upper "ear" that I'm talking about. Another update - I decided to trim the floorboards, I only had to trim a little off of the bottom of the middle board, everything clears now. Now if I can just get the equalizer assembly that is on back order from Lang's, I'll have everything I need to wrap up my AC brake installation! Good! You should use that spring to pull the pedal back. Especially with your o rings and the rocky mountain linkage and equalizer, it will be helpful to have a little bit more spring holding the pedal back. If it turns out that I need even more spring force to help the brakes release, I'll order another spring kit and either mount one on the pedal "ear", or mount both of them to the equalizer as per the instructions.